Getting rid of debt is one of the most popular topics nowadays for most people. Financial institutions, retailers, and other companies have worked very hard on their advertising to the point that they have persuaded a large part of the population to buy now and pay later. While it seems attractive for us to be able to have items we like at our disposal today, the trouble comes when we don’t estimate the costs in the future when the paycheck arrives we don’t have enough funds to pay our debt back. If you are reading this book, I am assuming you are already in debt. Don’t worry; you are not alone. First of all, you have to ask yourself one question. Make that two. Do you feel comfortable being in debt? If your answer is yes, then you can stop reading right now. If not, do you envision your life a whole lot more rewarding if you were debt-free? The reason why I am asking these questions is that this is a driving force that pushes someone to make fundamental changes in his life, and that is motivation. Being in debt usually provokes fear in a person. There are many unwanted consequences that can follow not being able to repay your debt. Additionally, it is stressful to get to the end of the month wondering if you are going to be able to meet your needs at the same time you repay your loans. Now visualize yourself how your life will be without having these unneeded stressors. Imagine the feeling of calmness that is associated with not owing anything to anybody. It is priceless. Besides, you will get enough funds from your income to enjoy with your family and friends. It is important to emphasize that the information you will be reading in the next chapters won’t require from you to become a minimalist super-frugal specimen. If possible, it is highly encouraged that you continue having your current lifestyle since the goal is to live a fulfilling life, not getting rid of debt at all possible costs. Once you become and remain debt-free, you can start looking forward to improving your standard of living if you desire to do so. Let’s get started. You will need a methodology to get rid of debt. You want to have one to go through the process more smoothly. Trying to get rid of debt randomly will only cause confusion and frustration – which you want to avoid since being already in debt is not a pleasant experience at all. a. Why Use a Specific Methodology for This Purpose? 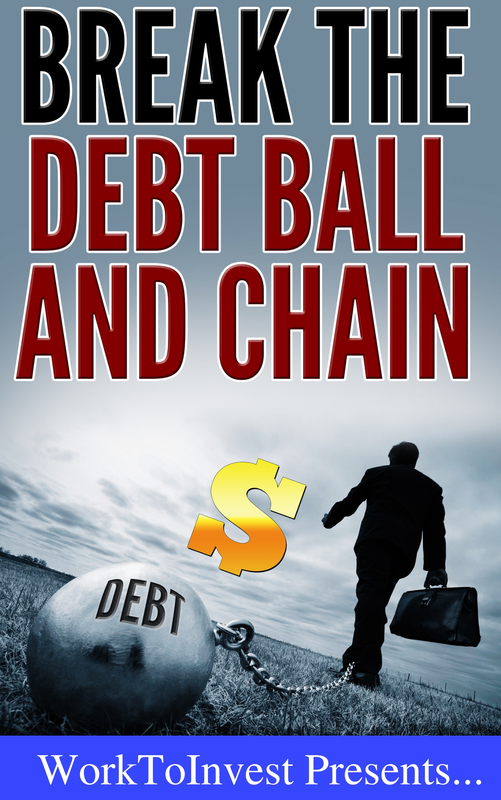 There are three methodologies outlined in this book which are meant to help you get rid of debt. These methodologies are efficient and effective, meaning, they work and you will start seeing results soon after applying any of them. The results should work as evidence that will subsequently keep you motivated in your goal of becoming completely free of debt. It is better to choose one of them and stick with it. This way, you can follow steps that won’t overlap with the steps of any of the other two methods, as doing this can be counterproductive. The advantage of using a specific method is that your plan of getting rid of debt becomes focused and you can have in mind your goal while executing the steps given. The methods shown below are simple and straightforward. We won’t be making you calculate complex formulas nor decipher intricate algorithms in order to repay your debt back. However, there are two steps you need to follow before choosing any of the methods below. These are tracking your expenses and then making a simple budget. The reason for this is because you need to determine exactly how much money do you have left at the end of the month for debt repayment purposes. First of all, you need to know how much money you are spending in order to calculate how much money you have available exclusively to pay off your debts. Right now, there are cheap yet useful apps in the market such as “You Need a Budget” and “Mint” which can save you a lot of time. If you want, you can do it manually also or in an Excel spreadsheet. You should have general classifications such as “Food,” “Clothing,” “Gas,” “Entertainment and Leisure,” and so on. This will take a month but it will give you an insight into your spending habits, and it can feel very rewarding. You will also be taking advantage of this information to keep yourself debt-free by cutting down expenses (more on this later). All of us know how important having a budget is. However, very few of us come up with one. One of the best budgeting styles to get rid of debt is the “Zero Dollar-Based Budget.” With this type of budget, you will be allocating each dollar to a specific category. Since you have already tracked down your expenses (after tracking them for a month such as stated in the previous paragraph), then you should know more or less how much to allocate to each one of the categories you normally spend money in. Note that there should be a “debt repayment” category at this stage. At this point is where you decide how much money you have available to pay off your loans. Also, if possible add a “savings” and an “emergency fund” category if you have enough funds for them. Note that you shouldn’t sacrifice your emergency fund to pay off debt as the money in it is vital as it will be explained in the following section. As a basic premise, you should already know how much money have you decided to allocate to paying off your debt. This method should be chosen if you feel very discouraged when thinking about your current debt level. This is because, with the snowball method, you will focus on paying off your smallest loan first. As with all other methods, you should make the minimum payment on all debts. However, the remaining extra funds should go to the loan with the smallest balance. Once this debt has been paid, the same procedure should be repeated with the loan with the second smallest balance and so on. With the snowball method, you will see individual loans being paid off at the faster possible pace. If you have persistence and are more worried about paying the least amount of interest possible, then the avalanche method should be chosen. With the avalanche method, you should make the minimum payments on all loans except on the one that has the highest interest rate. On that one, you should put the minimum payment plus an extra amount which you had already decided in the previous step. This should be repeated on a monthly basis until the debt has been paid entirely. Then, repeat the same procedure with the loan with the next highest interest rate until it is paid off. Repeat this method with all subsequent loans until you become debt free. Although it may seem slow at first, as time goes by, you will start noticing how you can pay off individual loans more quickly which can be very rewarding for your goal of becoming debt-free. In short, with the snowball method, you will see results faster. However, you should be able to get rid of debt faster with the avalanche method. To use this method, we have to first define what a “good” and a “bad” types of debt are. “Good” debt is the kind of debt that is used for investment purposes, meaning, debt that is meant to benefit you financially in the future. Examples of “good” debt include mortgages, and business and student loans. “Bad” debt includes consumer spending debt (loans used to buy furniture and other household goods) and credit card debt (which generally has very high interest rates). The reasoning behind using the “bad debt first” method is that usually “bad” debt has higher interest rates than that of “good” debt. So to some extent, it resembles the avalanche method. However, there is another advantage of using this method. By dividing debt into “good” and “bad” classifications, you will be more likely to avoid incurring into “bad” debt in the future. In short, not only will you be paying off your debt at a relatively fast pace but you will hopefully be also uprooting your bad financial habits and avoid making these types of mistakes in the future. The goal of paying all of your debts can be pretty hard. However, you can prepare yourself psychologically by setting small milestones. By using any of the methods above, you will be paying loan after loan in a certain order. For this reason, you should set up specific milestones that indicate when will you pay the first debt, then the second debt, and so on. Don’t forget to provide a timeframe for these milestones. Even if you don’t pay your debts exactly as planned, they can serve as indicators on when you may approximately pay off each individual debt. Getting rid of debt is one of the main financial goals for us. Goals should be specific and have a time frame so you can have at the back of your mind when will your goal be reached. It avoids procrastinating, and it gives you more willpower to keep on going. For this reason, setting up milestones shouldn’t be skipped. Getting rid of debt sometimes requires more than just choosing a specific methodology. This is because after making a budget, sometimes people realize that there is very little extra money left (if any) to set aside for paying off debt. Here are very important tips you should read and put into practice to help you reach your goal. Remember that getting rid of debt sometimes requires a multi-faceted approach. If it is enough for you to simply make a budget and choose any of the methods presented in the first chapter that is fair enough. However, sometimes you need to get additional income (as shown in Chapter 3) or follow the tips on this chapter. At the end of the day, you want to get rid of debt without having to change your lifestyle dramatically. If you are in debt, then you are probably spending more money than you need to. Reducing big expenses is a killer move to help you have more funds for debt repayment purposes. Big expenses include transportation, housing, and food. You should consider moving to a smaller place if rent is eating up a considerable amount of your income. Pretty much any city will have a safe neighborhood that has a lower cost in terms of rent and utility bills than the one in which you are currently living in. If you live alone, then getting a roommate is also an option. If you are eating out numerous times every month, you can decide to cut that in half. Also, you can start shopping for cheaper foods at the supermarket than the ones you currently buy. In terms of transportation, biking has become a popular alternative. If you have a car you may choose to take public transportation instead. Now that you have made substantial changes in the large expenses, small costs should be reviewed and analyzed if you still need more funds to pay off your loans. Anyhow, trimming down unnecessary costs will also be healthy for your finances so this is a good habit you may want to stick to. In this realm, there are many changes you can make in order to keep more money in your pocket. There are free and cheaper ways to enjoy life than what people are normally accustomed to. For example, going to the library is cheaper than buying books. Farmers markets are cheap places to buy your groceries from and there are also plenty of coupons available online or the newspaper for various items ranging from food to clothing. In thrift shops, you can get discounts of up to 90% of an item. Buying clothes off-season is also a good way to get similar discounts. Instead of going to the cinema, you can decide to watch movies on the TV. Netflix is also a cheap alternative to going to the movies. The plan is to get some ideas and start taking some kind of action. Even if you want to pay off your debt with all your heart very quickly, you should always save some amount monthly. It is advised that you should keep as savings 10% of your income. However, this may not be feasible if you are highly in debt. Target to save 5% monthly if possible, if not you can start with a smaller percentage until you get to the 10% even if this takes time since your primary goal is to pay off your debt. When speaking about savings, we should also speak about the emergency fund. According to experts, the emergency fund should have funds available for 3-24 months of your expenses. In case you lose your job or your income streams, you can live for some time before looking for either a new job or a new way to make a revenue. An emergency fund of 6-12 months should do the trick. In case you don’t have one yet, you should allocate the amount you decide to save to the emergency fund until reaching the desired amount. Then, you can start saving for other financial goals you may have in mind such as buying a home, going on a vacation, etc. Skillful negotiators say that everything is negotiable. One of the many fields in which you can and should negotiate in order to pay off your debts faster is interest rates. There are two ways you can approach this issue. First of all, there are banks that offer balance transfer cards with a 0% APR (annual percentage rate) for a certain time. The way it works is that you will be basically transferring the debt on all your cards to the new one. This will not only make the whole process easier but also cheaper. Sometimes balance transfer cards come with a fee. If you can find one without a fee, great! If not, shop around and always make sure that the total amount you are going to pay with the balance transfer card (fee included) is lower than the amount you have to pay with your current credit cards. The trick here is to try to pay off the balance transfer card as soon as possible or even before the 0% APR loses its validity. This is because after this period ends, the APR jumps to very high levels. That being said, the “Bad Debt First” method should be considered if you get a balance transfer card since most of your focus will be put towards paying it. The second approach is to call each one of your credit card issuers and politely ask them to negotiate the APR to a lower rate. If you have a good history with that financial institution and have shown them that you have paid your debts on time, they may accept your offer. If they don’t accept it, you can look at the balance transfer cards as stated previously. The reason why this “tip” is mentioned here is to emphasize on the fact that an extra amount should be allocated to your monthly debt payments besides the minimum payment. Doing the minimum payment is comfortable (or at least more comfortable than paying more than you are used to). However, if you have long-term debts such as mortgages or student loans, paying the minimum amount required will definitely not get you out of your current financial state for years or even decades to come. If you have money in your savings account (besides the emergency fund), then you should think about using it to lower your debt levels. A savings account pays very little interest. Additionally, if you already have an emergency fund, you shouldn’t worry about not being able to meet your needs in the future. You should also consider cashing out your investments, especially, if the net rate you are obtaining from them is lower than the interest rate you are paying from your current loans. Getting a raise is always fun. However, these funds should be used wisely in order to get you into deeper debt levels. According to experts, if you receive a raise, the extra amount should be allocated to paying off debt. There are two reasons for this. First of all, it will help you reach your goal faster. Second, if you start spending that new extra money you may get accustomed to a new life with your new income and you may even need more debt to support it in the future. Note that it isn’t wrong to pursue a new and better lifestyle, it is just better to wait until you have become totally debt-free to do so. Other ways in which you can receive unexpected money are gifts and inheritances among others. If you have close ties with your family and friends, then you can ask them to lend you some money without having to pay interest on it. This move will make your financial burden less heavy, just remember to pay the new debt back so you can keep the friendship alive. Also, if you repay the money back, they will be willing to help you in the future if you need financial help again. In the previous chapter, we talked about setting up milestones for each individual debt. While the fact of reaching a milestone is motivating in and of itself, you may wish to reward yourself when you accomplish these smaller goals. Hanging out with friends, getting a special dinner to celebrate with your family or going to the movies are just a few of the ways you can do this. While there may be a cost involved in celebrating a milestone, this should be looked at as a small “investment” meant to strengthen your new debt-free habit. I am really impressed at people who have mastered the art of couponing. While I wouldn’t spend a good part of my day collecting coupons, it is nevertheless remarkable how some housewives have managed to actually make money out of their supermarket purchases. Not only do they get free stuff but they get paid for it! Even if you don’t want to take couponing with such an intensity, gathering a few coupons on items you buy on a regular basis will definitely cut your expenses to some extent. These savings will allow you to have more available cash for paying off your debts. In the previous section, we talked about how changing your method of transportation could be highly beneficial for your finances. You can also decide to sell your car and use that money to pay off your credit card debt or another small loan. You will also be saving on insurance and gas so it’s a smart move that will decrease your debt levels noticeably in a short time. Once you become debt-free you can always have as a financial goal to buy a new car anyways. Use technology to your advantage. There are some free apps that allow you to track your expenses, set up limits to your expenses depending on the category, set up and track financial goals, monitor your investments, set up alerts when a bill comes due, etc. An example of this is Mint. You may find that using a budgeting app will help you in keeping your focus more on paying your debts more. Additionally, you can keep using since the dashboard gives you a glimpse of your financial state at any given time. Other budgeting apps that I am aware of are YNAB, Quicken, and Banktivity 5. Some of them require a one-time purchase or a monthly subscription. I recommend choosing a free one for now so you don’t incur in additional costs. You can always update to a new one that offers features you are interested in once your finances are in order. The power of a good environment can’t be overstated. In fact, it has been proven that a strong environment can make us act against our will. While this may seem a bad thing, it isn’t if you are trying to persuade yourself to become financially stable. The company of people who are in a good financial shape, meaning, who don’t have debt and invest their money in diverse financial instruments should be pursued. To make it easier, you can also find people online such as in FB groups and forums and stay in contact with them for this purpose. Although this should be a no-brainer, your emotional brain may lure you to participate in get-rich-quick schemes so you can come out of debt faster and with no effort involved… However, this should always be avoided. Usually, any scheme that offers a rate of return of over 100% of your investment in less than a year is a pyramid scheme. Some will offer even more than that but don’t be fooled by them. You can spot them because they GUARANTEE that you will get such a rate. Average rates of returns for investments range between 5-20% annually. There may be some legal investments that offer really high rates of returns such as equity crowdfunding or investing in precious metals, but they will let you know there is risk involved and that you can lose your money as well. Being healthy means that you will be spending less time going to the doctor, paying for medicine, etc. Being healthy in this society is not easy. Most of us eat lots of junk food and we live sedentary lives. Thus, if you don’t live a healthy lifestyle, you should approach becoming healthy just as you approach getting rid of debt, that is, by making it your goal and committing to it. Exercise for 30 minutes daily 3-5 times a week. This can be as simple as going for a walk or if you want a more intense activity, you can go swimming or jogging. -Stop eating junk food. You can do this gradually. If you are accustomed to eating junk food several times a day, cut it down to one time only. Do this until you either stop eating it completely or on very rare occasions (once a month or less). Eat more green vegetables and reduce the intake of red meat and dairy (this is according to advice made by the Harvard Medical School). Reduce stress as much as possible. Exercise will do the trick, but you may also want to have meditation sessions or yoga if you still feel a bit overwhelmed by the pressures of life. – Sleep 8-10 hours daily. Also, before sleeping calm your mind as much as possible and avoid using the computer or watching TV. Again, these are just very basic guidelines. In my blog www.worktoinvest.com/Health I also tackle this subject since it is so important not only for your finances but also for your well-being. Keep in mind this is a long-term journey. To read the rest of the book, please go to Amazon, also check out our other books as well.